Going under again! It doesn´t feel like it´s been just over a year, but let´s go back to January 2017, when we discussed #27 Deep Six. Today we have arrived at #64, and yes, it´s Deep Six again. Now this is actually the first figure of Deep Six I remember. 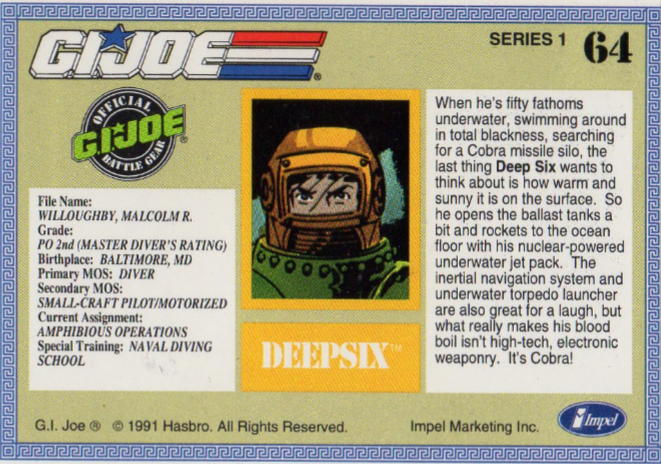 In fact, it was the second version of Deep Six, a total of 8 figures have been released of Deep Six. I’m not going to rehash all that I said last year, instead, I’d like to take this opportunity to talk a bit about the re-releasing of figures over the years. I can understand why Hasbro would do this, it brings in a lot of cash and the molds were available. And if it’s done creatively, I guess I can agree with it. Question is, do we really need 16 different versions of Scarlett, 68 (I kid you not) versions of Snake Eyes or 19 versions of Shipwreck? 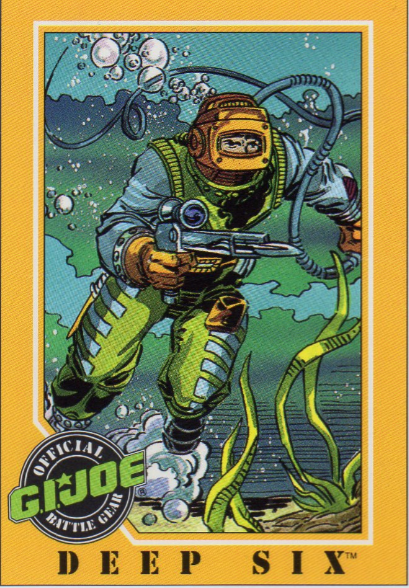 The Joe universe has a ton of great characters we never saw a figure of or just 1 version was released. I really think that even with the available parts, a lot more different figures could have been released. I mean take a character like Scoop (ok, he only came on board in the DIC cartoons and wasn’t that popular, but he is one of my favorite figures). Only one figure was released back in 1989. This year an updated version was released through the FSS 5.0, but frankly, that’s too rich for my taste. Don’t get me wrong, the figure does look great and I would definitely want to add some of those figures to my collection, but purchasing them is a big cost already ($31.25 per figure). If I add the shipping costs and import duties per shipment, the price for one figure totals at about $60 for me. As much as I like – no love – G.I. Joe, I just can’t pay that kind of money for it. Sorry for yet another rant about this, but seriously, international collectors are really … well, screwed for lack of a better word. Back to the point I was trying to make. We could have gotten so many figures we didn’t. Professor Apple, Candy (or Bozo), the White Clown, Magda, … I’m sure you all know some great characters that were never made. Some of these have been created by customizers, but those are not available for most fans. Time to wrap it up for this time around. Next time we’ll take a look at another one of my favorite figures that also got a mere 2 figures released (the second one being a straight repaint, 50 shades darker 🙂 ) Thread carefully and see you again next time.